The HSE team who won the De Care Dental corporate challenge trophy. From left: Padraic McVann, Mari Johnston, Lynda Hession, John Kelly. The 5k one lap course is the same as that used for Mayo AC’s Summer Series. Conditions were warm in the continuing sunny spell with a nice breeze for much of the course. There was an excellent turnout of 130 runners and walkers, with numbers boosted by the corporate challenge – 12 teams competed for the trophy. There were two distinct races, the open race and the corporate challenge, with prizes for each based on entry. In the open race Tom Prendergast (18:01 ) emerged the winner though pressed hard by Brendan Hession (18:17 ) in second. Tony O’Malley came through for third place in 19:00. Local athlete and prolific winner Kathy Gleeson was first woman home (19:17 ) – she won the two De Care races in 2016, 2017 when it was an 8k event and the Ballinlough 10k on Saturday last. Kathy Gleeson was challenged throughout by Mary Gleeson (19:31 ) making a welcome and excellent return to racing. Sylvia Malone finished third in 20:31. 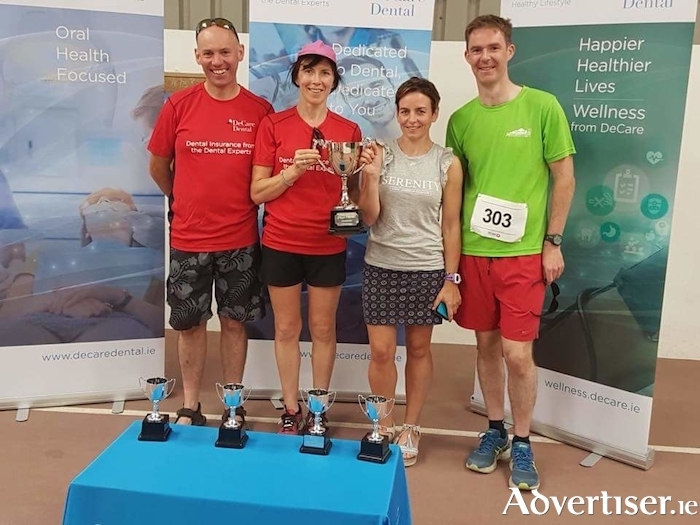 The HSE team won the corporate challenge trophy – they were led home by John Kelly (19:49 ) well supported by Mari Johnston (19:53 ), Padraic McVann (20:10 ), and Lynda Hession (22:07 ) – three Mayo AC plus Mari from Sligo AC finishing 10, 11, 12, 20th overall. Maureen Walsh CEO De Care Dental thanked all who helped organise the race on and off the course, stewards, announcer, and main man John Timothy, Order of Malta, and volunteers from ISPCC Childline for whom it was a fundraiser. All enjoyed the post race barbecue. Men: (1 ) Tom Prendergast (Claremorris ) 18:01; (2 ) Brendan Hession (Mayo AC ) 18:17 (3 ) Tony O’Malley (Mayo AC ) 19:00. Women: (1 ) Kathy Gleeson (Claremorris ) 19:17, (2 ) Mary Gleeson (Claremorris ) 19:31 (3 ) Sylvia Malone 20:31. Men O50: (1 ) Stephen Skillington (Mayo AC ) 21:09; Men O60: (1 ) Jimmy Feeney (Mayo AC ) 22:13; Women O50: (1 ) Eileen O’Brien (Mayo AC ) 31:30; Women O60: (1 ) Patricia Brennan 53:34. Corporate Challenge: (1 ) HSE team 1:22.01, (2 ) CBE team 2 1:35.39, (3 ) Kavanagh Group 1:38.01.